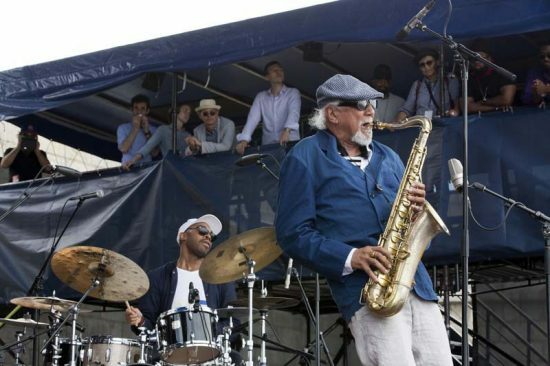 Near the close of an hour-long set by the Dave Liebman Expansions Group at this year’s Newport Jazz Festival, which ran July 29-31, the soprano saxophonist and leader reminisced aloud about his very first Newport. Liebman is an imminently likable onstage personality, who explains and announces his program without overdoing it, mostly letting his earthy Brooklynite demeanor provide the charm. Anyway, he explained how in 1966 he’d been spending his Sundays in New York with a mentor, the saxophonist and composer Charles Lloyd. In early July, Lloyd called on the 19-year-old for a favor: Could he drive his rhythm section up to a gig at the Newport Jazz Festival? Jazz-history buffs should be able to place the band with little trouble: It was the unit that would record Forest Flower two months later and make Lloyd a baby-boomer hit, featuring pianist Keith Jarrett, bassist Cecil McBee and drummer Jack DeJohnette. Liebman’s roadie duties also allowed him to take in the final Newport appearance by John Coltrane, whose quintet included Pharoah Sanders on saxophone, wife Alice on piano, Jimmy Garrison on bass and Rashied Ali on drums. A Trane disciple who’s spent a healthy chunk of his life decoding the master’s art, Liebman said he’d seen Coltrane many times at that point; still, the modestly attended set, which included “Welcome,” “Leo” and a locomotive take of “My Favorite Things” that spilled well past 20 minutes, has stayed with him. As if offering proof, Liebman led his band through a fantastic rendition of Trane’s “India,” underscoring both his thoughtful devotion and the strikingly intuitive rapport of his quintet. Liebman’s “India” was also an example of Newport continuing to deliver on the promise of its fabled past. Lloyd did the same on Sunday afternoon, floating his gorgeous, feathery tenor and flute phrasing out across Newport Harbor, as one of jazz’s deepest rhythm sections-pianist Jason Moran, bassist Reuben Rogers and drummer Eric Harland-both followed and guided his whims. Hearing a melody like Lloyd’s “Dream Weaver,” planted between water and stone at picturesque Fort Adams, certainly seemed historic, the kind of moment that compels you to savor it for reasons you can’t precisely name. I’m sure Liebman felt a similar pang all those years ago. Newport’s enduring home surely helps keep the festival in your mind’s eye, and raises the stakes in regard to weather. On sold-out Saturday, blessed with sunny skies and a high of 82, a postcard came to life: the sailboats out on the gleaming harbor and East Passage of the Narragansett Bay; the miles of lawn chairs and mini-coolers dotting the grounds in front of the main stage; the eager student musicians hopping from set to set; the lobster rolls. The prior day, windy and wet and miserable through its first third, one thought was inescapable: “If only it weren’t raining.” Not surprisingly, attendance was poor. But Newport might still prove indelible were it transplanted to a convention center. In 2016 its programming was a potent mix, as well as a considered and diplomatic one. There is no particular aesthetic bent to Newport’s design, other than authenticity and a willingness to seem definitive. The living legends need to fit among jazz’s current popular headliners; the avant-garde needs a place alongside dependably swinging acts; lived-in bands should be featured, as well as special limited-run projects; tip the hat to today’s electronica-infused jazz-rock, and save space for a couple of tasteful crossover acts. Try and stagger the sets in a way that won’t force them to compete, knowing that failure is inevitable but that the four-stage setup allows the festivalgoer to remain in perpetual motion. In the end, the program somehow manages to define current jazz within a single weekend, so much so that to discuss the festival is to critique the music itself. Based on Newport 2016, the state of the union is strong. The schedule included unimpeachable working groups, the sort that make you wonder if modern jazz could possibly be played better. Chick Corea’s Trilogy, featuring McBride and drummer Brian Blade, performed twice, at the fort and at Friday evening’s concert at the International Tennis Hall of Fame, where a pair of standards, Bud Powell’s “Tempus Fugit” and Miles Davis’ “All Blues,” betrayed a lifetime of reharmonizing changes and displacing swing. The quartet co-led by guitarist John Scofield and saxophonist Joe Lovano, and filled out by bassist Ben Street and drummer Bill Stewart, reminded you of the glories of a great bebop frontline, tangling and untangling and thrillingly charging through unison heads. Aziza, the newly formed all-star quartet of bassist Dave Holland, saxophonist Chris Potter, guitarist Lionel Loueke and drummer Eric Harland, matched pliant, interactive fusion with elements of West African groove. Also in this nonpareil category are two singers who found an absolute median between R&B and straight-ahead jazz singing-and who are capable of hushing a fidgety festival crowd through sheer splendor-Gregory Porter and Lizz Wright. A few still-rising acts made for festival highlights. Pianist Sullivan Fortner’s quartet, featuring the under-regarded saxophonist John Ellis, embellished mainstream swing with youthful passion and a more progressive and communicative group dynamic. Etienne Charles & Creole Soul played Caribbean-jazz that seemed custom-built for the festival circuit, performing Charles’ rhythmically savvy originals and interpreting Bob Marley. The young tenor saxophonist Roxy Coss, performing in the club-like Storyville space added last year, came off like a resolute bandleader equally at home on burners or ballads. Joey Alexander, an unabashed jazz celebrity at age 13, has clearly found his comfort zone, and thrusted through his new album’s title track, Coltrane’s “Countdown,” near the top of his set, as if to prove that fact. Jazz’s other current popular phenomenon, saxophonist Kamasi Washington, pulled from his now-familiar well of tunes at two slots: one on the main stage, where his band did its customary break-the-house-speakers bit, and one on the more intimate Quad Stage, which in effect mitigated some of the group’s bombast. Still, at the world’s premier jazz festival, Washington and co. had far more in common with headlining funkateers Galactic than with Charles Lloyd. Further out, Steve Coleman and Five Elements sounded stupendous, and made the leader’s algebraic bop-funk feel more satisfying than a static groove ever could. A rare set by bassist Eric Revis’ quartet Parallax, featuring saxophonist Ken Vandermark, drummer Chad Taylor and Kris Davis in a piano chair typically occupied by Jason Moran, also offered out-jazz that impressed on a body-and-soul level. Strong melodies, determined rhythms, wide-open improvisation and scurrying freebop-this hour contained multitudes. Ditto a day-opening main-stage set by Darcy James Argue’s Secret Society, performing the composer’s program “Real Enemies,” a demanding meditation on the nature of conspiracy theories. A pair of left-of-center guitarists gave arresting performances with similar m.o.’s: Marc Ribot and his Young Philadelphians, paying tribute to vintage soul with a string section and crucial contributions from bassist Jamaaladeen Tacuma, and Nels Cline, premiering the postmodernized lounge-era mood music of his recent Blue Note debut, Lovers. Both sets had the neat effect of old-school studio magic unfolding in real-time, and both left the necessary room for guitar heroism. For Cline, that meant largely forgoing effects and relying on the warm, sensual tone of his Gibson hollowbody. Early on a bright Sunday, with the main-stage crowd quietly setting up camp, sound and setting achieved a glorious equilibrium.